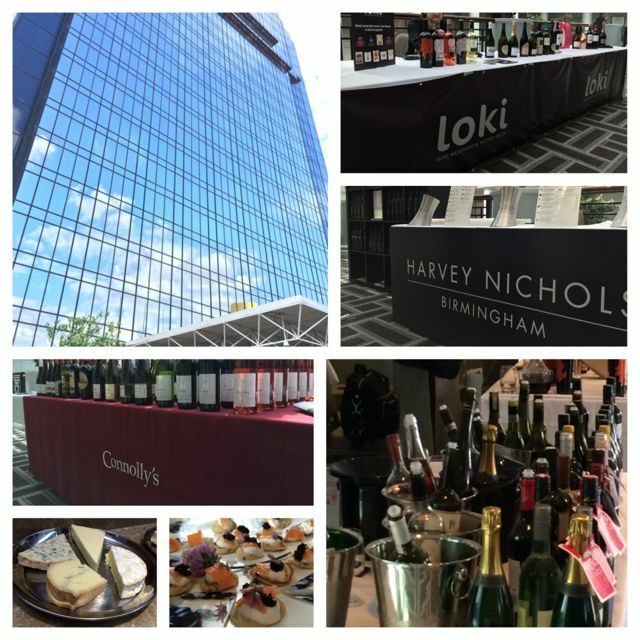 Amy Seton has brought you lucky people of Brum not only The Whisky Festival for the last two years, but this year also Birmingham’s first large scale two-day Wine Festival. 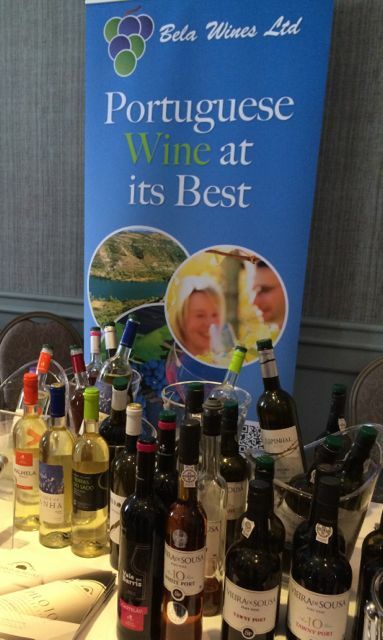 Held in the upmarket Hyatt Hotel on Broad Street the event bought you stalwarts of the Birmingham wine scene and also producers and importers from far afield. Tickets were £25 and for that you can troll around all of the exhibitors trying their wines while they happily extol their virtues. It’s a good event if you don’t know what you like wine wise – give them all a go, make some notes, work out which countries and grapes you do and don’t like, find some interesting distributors who’ll help you build your cellar. There were also masterclasses available (tickets around £10 at the event) where you can learn all you’ll need to know about the various topics on offer from passionate tutors. Masterclasses this year included Italian Wines, French Wines, and Cheese and Wine matching. One of our very favourite venues, Loki Wine, was at the event with a selection of their finest wares. You should definitely pop in to their shop in The Great Western arcade where you can buy a tasting card and enjoy self-serve samples of their interesting offerings from the innovative enomatic machines. Connolly’s were also on hand and you can visit them either just by Snow Hill or in Solihull. We were forced in to trying a Harvey Nichols Beaujolais, a snip at £13, by the lovely Kusum who’s always around the store if you need a hand picking a bottle. We also had a few samples from the good folks at Laithwaite’s who have a branch in Solihull. 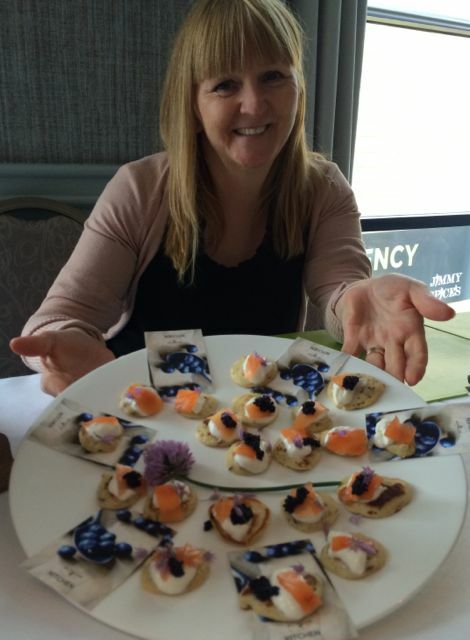 As a mid-festival nibble we tried delicious canapés from an up and coming Birmingham business, Kitchen School by Jane Bradley. You’ll be hearing more from her over the coming months as she’s expanding her cookery school. You can follow her on Twitter too. Then back on the wine, we tried dozens – our livers would’ve been better served had we have used the spittoons, but I can’t bear to waste good wine. My favourite of the evening was a white Portuguese wine by Quinta do Piloto, made from a not much used grape variety – Moscatel Roxo. The producer, a 4th generation vintner, was on hand to talk us through its complex characteristics. 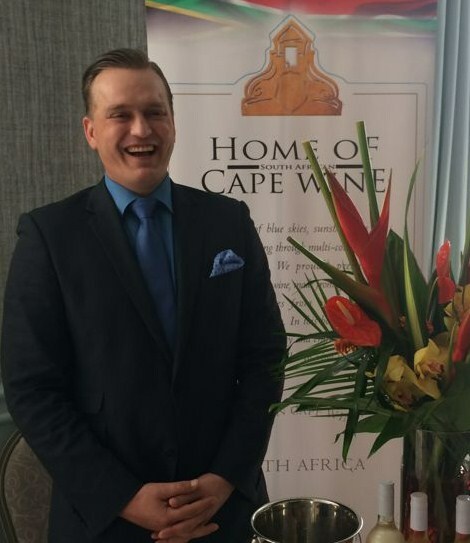 If you’re interested take a look at the importer Bela Wines Ltd. Winety Boutique Wines also provided a snifter or two, they specialise in importing wines not previously available in the UK. We had a gulp of each of the Indian Wines on offer from Soul Tree. 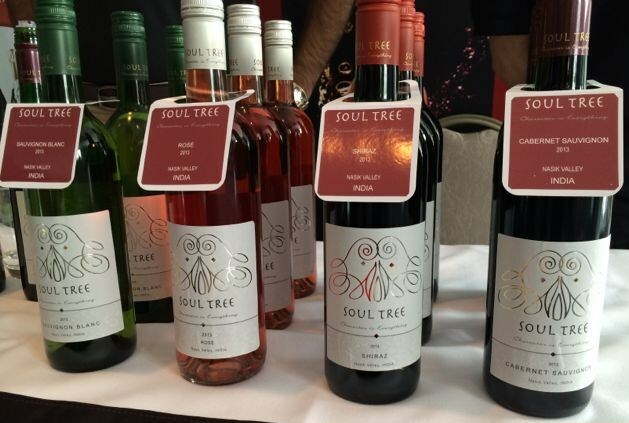 I do think that Soul Tree’s offering was better than some of the other Indian wines I’ve tried, but I still can’t square drinking wine with Indian food, it’s lager all the way for me! Our next stop was to Home of Cape Wine – a producer and importer of South African table wines. Its front man may be familiar to any of you that know Brummy dining, as it’s the affable and charming Daniel of MPW. Without further sustenance I would have found the walk home rather too wobbly, so we joined Nicholas from Curds & Whey in Moseley for a wine and cheese matching. Nicholas is an artisan cheesemonger and “afineur”. The latter is a profession well understood on the other side of La Mancha but little known here, affinage is the art of aging cheese which can dramatically change the flavour of a cheese, as proven to us by Nicholas. First up was an aged Wensleydale with a Slovenian Sauvignon Blanc (possibly a touch too acidic given the cheese was aged and had lost its Wensleydale sharpness). Then a Camembert de Normande with an SA Chenin Blanc, then a Morbier with an awesome Trimbach Pinot Gris. Finally we tried a strong but mellowed Bleu d’Auvergne with a sweet Moscatel. This man knows his cheese, and we’ll be seeing him in Moseley or at the Mac food market on the last Sunday of the month. So thanks to Amy (whom you can follow on twitter for all the super Brummy things she gets up to), for a drunken fun event. See you same time next year, by which point my liver should have recovered, and my cellar should be better stocked. This entry was posted in Special Event and tagged birmingham review, birmingham wine festival, Out In Birmingham, out in brum, OutInBrum, Where To Go In Birmingham, where to go out in birmingham. Bookmark the permalink.